One of my husband’s favorite things to watch is documentaries and interviews of the great NBA players of the 1990’s. Somehow I always get sucked into watching the basketball videos with him! I have learned more than I ever cared to know about Micheal Jordan and Larry Byrd. The latest documentary that I got lured into watching was about David Robinson. David was the all-star player for the Spurs in the late 1990’s, and he was used to getting all of the spotlight. Until Tim Duncan came along. David found himself having to share the spotlight with Tim. David was asked if it was hard to accept the fact that he had to share the fame with Tim. As I listened, I felt like David was speaking to me. Some days I find it difficult accepting my place as a SAHM after having worked outside the home for 9 years prior. There are days when the to-do list seems never ending and my son needs my constant attention. But if I’m honest, even when I was working outside the home, there were days when I wasn’t content with the place God had put me. However, I have found that when my focus is on glorying God in whatever I have been called to do, it is much easier to be content. It is easy to focus on everything else except glorifying God, comparing myself to other moms, friends, or even the “past me”. When I compare my current place in life to others, that is when it is easy to become discontent. Lately, I have been deliberately reminding myself to focus on glorifying God in all my responsibilities. Everything from running errands, cleaning the house, taking care of my son, and relating to my husband. What place do you find yourself in right now? 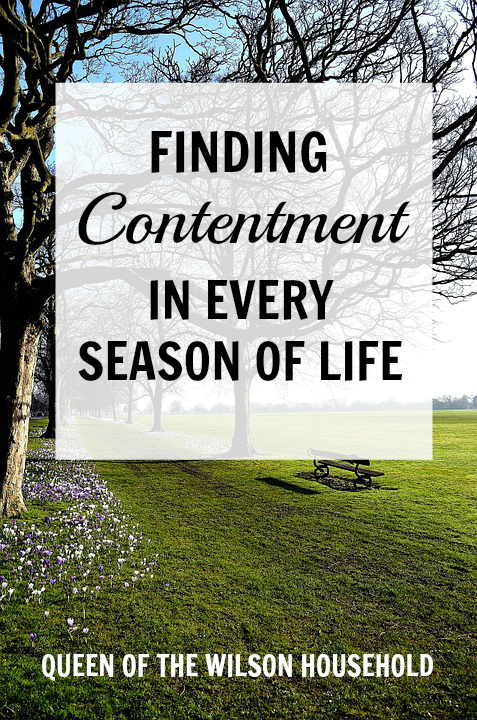 Are you having a hard time being content in your current place of life? Please be encouraged and know that God has placed you in this season. Focus on glorifying him. David Robinson was a class act and I love that he said this: "Some are placed at home taking care of children." It's so refreshing to hear someone like him have that perspective on moms. Love it! Great reminder to glorify God in all our responsibilities. Thanks! Emily, my husband finds the documentaries on Youtube, just in case you want to watch them! Yes, I didn't realize what a class act David Robinson was until I watched the documentary on him. It was such an encouragement to me! Sometimes redirecting our thinking is all we need. You hit it on the head when you said "glorifying God in all my responsibilities". I had a similar situation where I was so frustrated that I had to sacrifice so much and felt that it all fell on me. Until the day I finally realized that staying home was a blessing that I was not appreciating. When I turned my focus around I was able to see the blessing God had given me. Yes, Celi! The way we think about things can have such a huge impact. It is easy to think of staying at home as a burden at times, but it really is a blessing that not everyone gets the opportunity to have. I find when I give my day, my tasks, and my duties to God, I am much happier. Instead of resentfully going through another load of laundry, I use laundry folding time as a time to praise Him. Such a wonderful reminder you've shared here. Thanks for sharing! Our attitude and perspective is so important. Yes, I need to remember that I used to grumble in my old job and couldn't wait to be a stay-at-home mum, so I should be more grateful! Found you via the #SHINEbloghop. I'm from San Antonio and grew up watching David Robinson play. He's a great, Christian man to emulate. It was always the little things, too, like how he always stood at perfect attention during the National Anthem. What a great connection to find contentment! How neat to have grown up in the city where he played! I'm so glad my husband watched the documentary about him, because I really had no idea what a great Christian example he was until watching it.